LAST summer, 15 years to the day after the discovery in an Oxfordshire wood of the body of Dr David Kelly, the government scientist caught up in the post-mortem on the Iraq War calamity, I interviewed the award-winning investigative journalist Miles Goslett for TCW. The subject was his recently published book, An Inconvenient Death, an account of what preceded and followed Kelly’s mysterious death. Stories about this assumed suicide, Goslett explained, had ‘either asked or answered questions which had not been dealt with satisfactorily’. 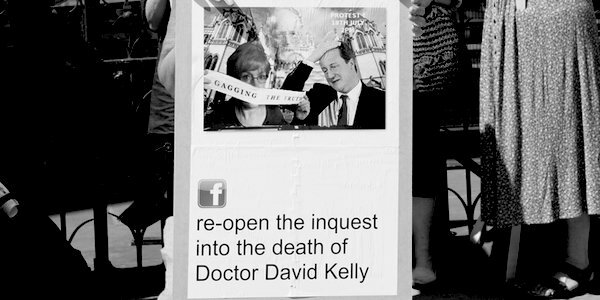 Furthermore, the Hutton Inquiry into Dr Kelly’s death, which concluded that the scientist had committed suicide, was not a full coroner’s inquest. That Dr Kelly had been denied this, the right of everyone who suffers a sudden or unexplained death, is something that most journalists and political figures either accepted or just did not notice. The central focus of Goslett’s account was to expose the holes in the official story, to reveal a jigsaw that doesn’t fit. The path of painstaking research travelled in his book leads the reader, inexorably, to the conclusion of a cover-up, and that the Hutton Inquiry, set up with almost preternatural speed by Lord Falconer and the then Prime Minister Tony Blair, was a whitewash. I found it so gripping and disturbing that I made it one of my summer reading recommendations. Now, in the months that have followed, further damning evidence has come to light which shows that Dr David Kelly could not have committed suicide. After being contacted by John Scurr, a world-renowned consultant specialising in vascular surgery, Goslett has updated his book. Not only does Scurr not believe it possible that Dr Kelly died in the manner officially found, he also reveals that Dr Kelly’s half-sister, Sarah Pape OBE – a leading plastic surgeon based at the Royal Victoria Infirmary in Newcastle – rang him shortly after Hutton published his report in January 2004 to say she did not believe Dr Kelly had taken his own life. Another important witness, David Broucher, British Ambassador to the Czech Republic between 1997 and 2001, disclosed further evidence. Along with many others, Goslett believes it is essential that a full coroner’s inquest be held: ‘Only then can we start to know the truth about the troubling death of Dr David Kelly’. An Inconvenient Death: How The Establishment Covered Up The David Kelly Affair, by Miles Goslett, is out in paperback and can be found here. Previous articleWhy won’t Corbyn meet May for Brexit talks? Because he’s too thick? Next articleWho runs Britain – the people or the establishment?